Let me preface this by saying that I am a big fan of the old Disney classics. I grew up a "Disney Princess," if you will, so I have high expectations for animated Disney movies. 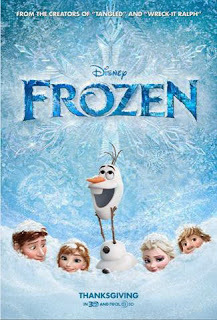 Disney's latest princess tale, Frozen, did not disappoint! A few weeks ago, I was invited to an advance screening of Frozen, although I was under no obligation to blog about it at all. As soon as the film ended, I gave a strong applause and immediately texted my nearest and dearest insisting they see it as soon as it comes out. Now that it's been in theaters a week already, many of my friends confirmed that they enjoyed it as much as I did. I absolutely adored Frozen, and I'd gladly see it again! This musical comedy is hilarious, contains a song performed by Idina Menzel that blew me away, and is entertaining for adults (even my male friends enjoyed), yet appropriate for children. The cast includes some of my favorites, including Idina Menzel, Jonathan Groff, Kristen Bell, Josh Gad, and more. Here are a few teaser clips, but get to theaters to see the show with the whole family! Another fun part of Frozen was that it did away with the overdone and outdated conclusion where it is the man that saves the helpless princess. I don't want to give anything away, though, so see it for yourself to find out how Disney has updated the road to Happily Ever After. The movie contained laughter for the most part, and some tears near the end. It's got something for everyone, so I DARE you to go check it out this holiday season! PS: I highly recommend seeing Frozen in 3D, if for no other reason than to see the animated short that is played before the movie begins. Yes, the movie itself made good use of 3D as well, but the Disney animated short entitled "Get a Horse" is out of this world. It's a cute cartoon involving Mickey and Minnie that is, yes, funny, but more importantly is the epitome of what 3D animation should be used for. I'd include a clip of it here, but it's simply not the same to see it on your computer. You MUST see this in 3D!! Did you see Frozen yet?? What did you think? HOW AMAZING WAS THE ANIMATED MICKEY MOUSE SHORT?!!? !